Natalie loves animals. She also loves video games. She absolutely loved going horseback riding the couple of times she went. What better gift for my girl ths Christmas than something that incorporates all three things into one? 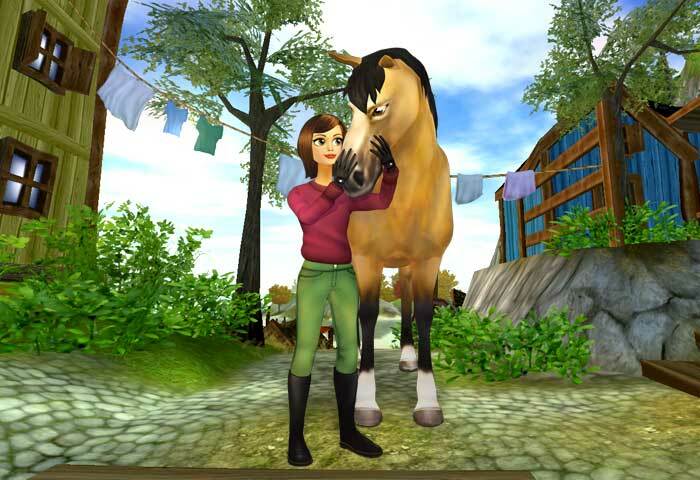 If you think you have someone special that would love the same, then have her ride with friends in the online horse adventure game Star Stable! Designed for girls 7 to 17 years old, she can care and train their very own horses, compete in races and solve the mysteries of this ever-expanding magical world. They begin their Star Stable adventure by creating a rider and choosing their very own horse! This alone was pretty much enough to sell Natalie on how great this game is, LOL. As she grows into a more experienced rider, special breeds become available. There’s really so much to do, I just can’t see Natalie getting tired of this game any time soon. She’s crazy for it! For example, she can start and join Riding Clubs, take part in competitions, or just share adventure stories with her friends in a cozy café or at the lively disco. 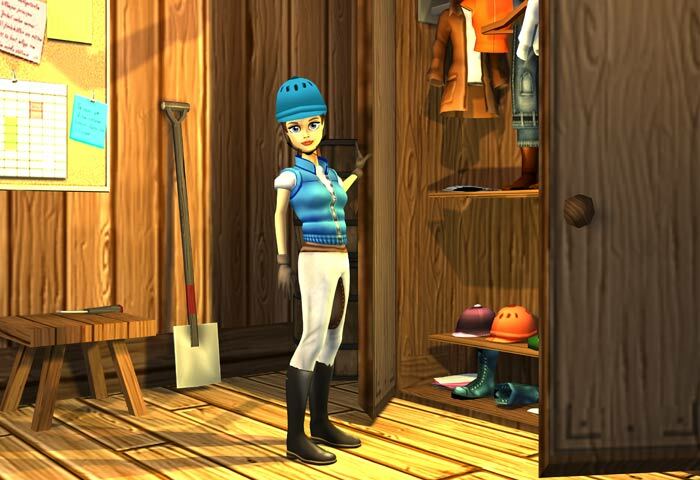 Along the way, she will meet many other players and characters as she travels on adventures through 18 levels to unravel the mysteries hiding in the mystical island of Star Stable. This part she really loves…interacting with other girls, including her real-life friends. If that’s not enough to keep your girl occupied, each week there is an exciting game update that adds to the adventure. There’s always something new at Star Stable – new adventures, new lands, new horses and new friends. I just love that. It really keeps the game new, exciting, and fresh. For gamer girls that can’t get enough of the in-game fun, Star Stable also has a new Talk Show that features behind-the-scenes interviews, new trailers, game tips, updates, giveaways and more. Additionally, The StarStable Shop is open for the holidays and includes all kinds of wondrous swag from slumber-party worthy pillowcases to an exclusive leather charm bracelet that comes with the Star Rider charm. Players can purchase four additional charms separately — each which represents something special in the game!! Fashion and gaming…where do I sign up?? Just in time for Christmas, I am so happy to share all of the fun with you!! Take a look and if you download the app, please let me know how you like it. Hopefully your gamer girl will find it as awesome as mine does. 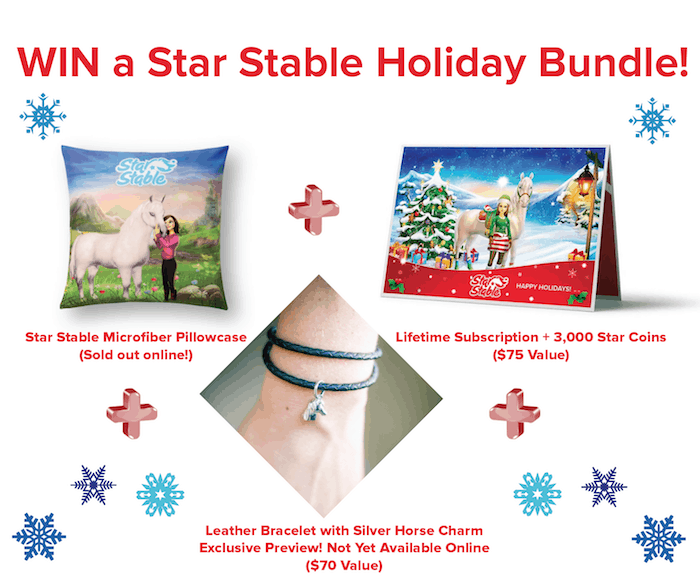 One (1) lucky Lady and the Blog reader will receive a Star Rider Lifetime Membership ($75 value), a just-released Star Rider Silver Charm Bracelet ($70 value), and a Star Stable Pillowcase ($20 value)!!!! Total Value $150+!